Suitable for general work. Economical standard speed model. used where practical to provide quiet operation. with mechanical-interlocking against line short by mechanical shock. as standard part for safer operation. is heat-treated and equipped with safety latch and 360º swivelling. Fuse is built in a primary side to prevent overheat. cut control circuit when reverse phasing. Except the 3 phase models of 250 kg and 500 kg, and single phase models. 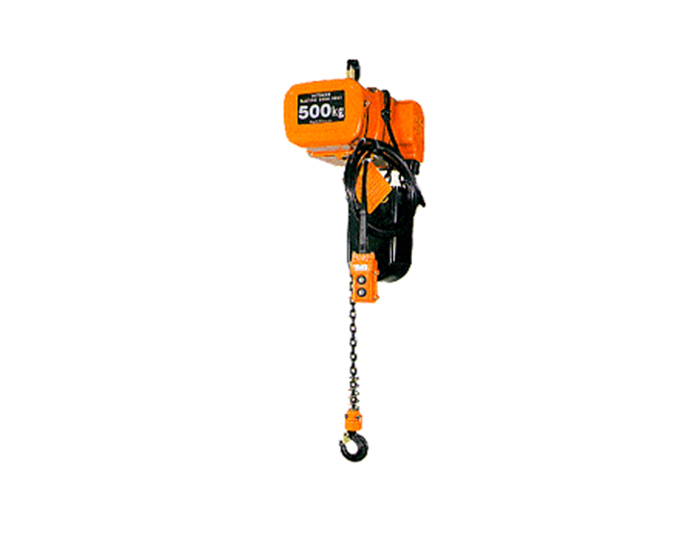 interrupt motor power to prevent hook overtravel and hazardous condition such as chain kink. reduce maintenance time and installation. is molded with strain relief wire rope into one body. This assures easier and safer operation. is rain-proof plastic for severe impact and corrosive atmosphere resistance and mechanically interlocked. The 24 volt control circuit reduce shock hazard to the operation.